Heat an 8- or 9-inch heavy-bottomed nonstick skillet over the lowest heat on your stove for about 5 minutes (if using gas, you should barely see the blue flame). Break open each egg onto a separate saucer, taking care not to break the yolk and removing any shell fragments. Add the butter to the skillet and let it slowly melt and gently foam, don't let it sizzle (if the butter doesn't foam the pan is too cool -- if the butter browns the pan is too hot). When foam subsides (about 1 minute), swirl to coat the skillet. Gently slide each egg off their saucer into the hot butter. Quickly season eggs with salt and pepper to taste, cover skillet and cook. The whites will gradually solidify from transparency into snow-white cream; the yolks will thicken slightly as they heat. Cook for about 2 to 2 1/2 minutes for runny yolks, 3 to 3 1/2 minutes for soft but set yolks, and 4 to 4 1/2 minutes for firmly set yolks. 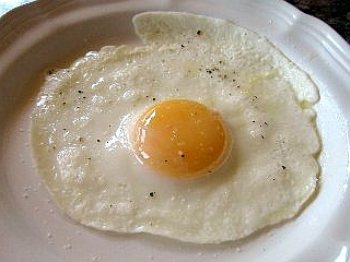 Do not flip the eggs but leave the egg sunnyside up and natural.